Tuesday, May 17, 2016 by: Isabelle Z. (NaturalNews) They might not be welcome in your yard, but it turns out that dandelions have tremendous potential when it comes to helping people who are suffering from cancer. Chemo-resistant melanoma is now the most common type of cancer affecting Americans aged 25 to 29. The only option doctors can presently offer these patients is surgery to remove the tumor and its surroundings, followed by immunotherapy, which does not usually work when the melanoma has metastasized. However, all that looks set to change, thanks to a humble plant that many people pull out of their gardens and throw away. At the University of Windsor in Ontario, the Department of Chemistry and Biochemistry has shown that dandelion root extract can cause human melanoma cells to essentially kill themselves without leading to any type of toxicity. In fact, their initial study saw cancer cells disintegrating within 48 hours, while healthy cells remained unaffected. The study was led by Professor Siyaram Pandey, PhD. These promising results prompted the non-profit organization Mitacs to reach out to AOR Inc., a Calgary company that produces natural health products, in order to develop a dandelion tea powder that is significantly stronger than that found in health food stores. They accomplish this by milling dandelion root, creating an extract from it, and then freeze-drying it into a powder that patients dissolve into hot water and then drink. AOR is producing 6,000 doses of this tea for a clinical trial that will take place at the Windsor Regional Cancer Centre, and will involve 30 patients with various types of cancer, including leukemia, who have not had success with conventional therapy. Since the commencement of this project, we have been able to successfully assess the effect of a simple water extract of dandelion root in various human cancer cell types, in the lab and we have observed its effectiveness against human T cell leukemia, chronic myelomonocytic leukemia, pancreatic and colon cancers, with no toxicity to non-cancer cells. Furthermore, these efficacy studies have been confirmed in animal models (mice) that have been transplanted with human colon cancer cells. Researcher and medical oncologist Dr. Caroline Hamm said that some of her patients have noted improvements after drinking dandelion root tea from health food stores. The concentrated tea could prove to be even more effective, potentially saving countless lives. A 2008 study published in the International Journal of Oncology showed that dandelion tea reduced breast and prostate cancer cells. A subsequent report in the same journal showed that a dietary supplement that contained dandelion suppressed the growth of prostate cancer cells. Dandelion extracts have also demonstrated their efficacy in treating breast cancer and leukemia in traditional Chinese medicine as well as in Native American medicine. 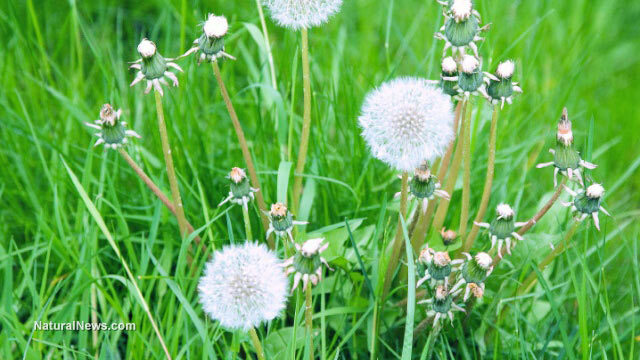 In addition, dandelion extracts show promise in fighting colon and pancreatic cancer cells. The benefits of dandelions don't end there. The root can also stimulate the secretion of bile, relieve allergies, reduce cholesterol and cleanse the liver. In addition, it contains high amounts of Vitamin A and Vitamin K.
This is just one of many natural cures that is showing great promise in treating conditions that conventional medicine has failed to conquer. Countless more natural remedies are likely growing in our planet's forests, oceans and even deserts, just waiting to be discovered.